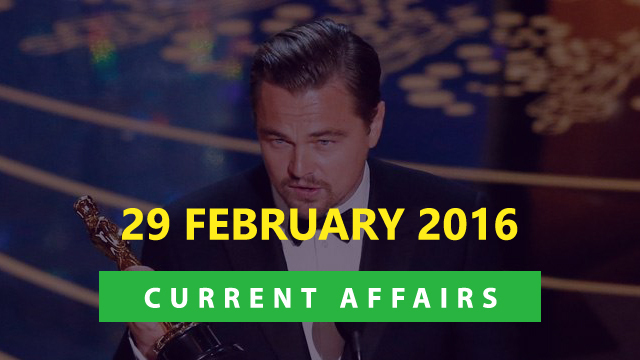 Hi Aspirants..Here is the Current Affairs Quiz for 29 February 2016. Trending topics include Oscar Awards 2016, Resul Pookutty winning Golden Reel Award, Stan Wawrinka, Sanjay Leela Bhansali and Ranveer Singh etc. 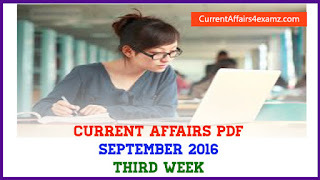 You can check details on each topic by attempting the quiz. 1) Which Indian on 28 February 2016 become the first Asian to win American Motion Picture Sound Editors’ (MPSE) Golden Reel Award? 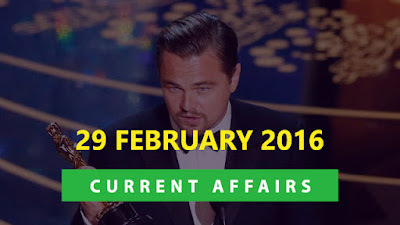 2) Leonardo DiCaprio won the Best Actor award at 88th Academy Awards ceremony (OSCAR 2016) for his film? 3) Which social media recently launched #Positionofstrength campaign in India to empower women to raise voices against any form of discrimination? 4) Which player has recently won the 2016 Dubai ATP Tennis title in the men’s singles category? 5) Which Indian was recently elected as the Chairperson of the Governing Council of International Fund for Agriculture Development (IFAD)? 6) Who among the following have been chosen for the prestigious 2016 Pandit Dinanath Mangeshkar Award? 7) Alok Kumar Verma has taken charge of new Police Commissioner of ____ on February 29, 2016? 8) Who among the following has been appointed as the first Chairman of Banks Board Bureau (BBB) on 28 February 2016? 9) What was the theme of National Science Day 2016 observed on 28 February? 10) Brie Larson won the Best Actress award at 88th Academy Awards ceremony (OSCAR 2016) for her film?